Slightly larger than the Black-headed Gull. Tail slightly notched. Legs dark and short. Adult: wing grey-white on the outer part with a black triangle at the tip, and darker grey on the inner part. Head white in summer, but dark mark on the ear coverts, and grey nape in winter. Bill green-yellow. 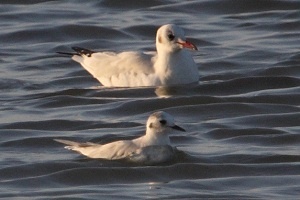 Juvenile and 1st winter: similar to the Little Gull juvenile in wing colouration and pattern, but distinguished by shape and flight. In addition, the back is uniform darker grey, there is more white in the primaries and the crown is not dark. Voice: repeated rapid, nasal “kitti-i-viiek”, and “kyal” in flight. L. 37-42 cm ; W. 93-105 cm. A little larger than the Black-headed Gull, with a very similar wing pattern. Also similar in general appearance, but with pale eye, long neck, whitish head (no hood) in summer, ear-patch faint or absent in winter. The silhouette and the shape of the head and neck are also different, with a slim bill and a sloping forehead, as well as a long neck. Legs are also relatively long. Adult breeding: Apart from the white head, the overall colour is very often tinged with pink. Dark red bill looking black from a distance, red legs. Adult non-breeding: usually lacks any definite pink colour. May have a faint ear-patch. Bill and legs paler than in summer. Juveniles: bill pale orange with a dark tip. Legs pale orange. Wings and mantle with pale brown markings. 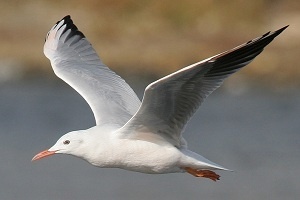 Voice: “rerrr”, similar to the Black-headed Gull, but harsher and drier. L. 37-42 cm ; W. 90-102 cm. Small. Distinguished from almost all other gulls by the white leading edge to the wing, and the black tips to the primaries. There is also an obvious dark area (dark grey) on the underside of the outer forewing, adjacent to the white border. The wing is pointed, the head is small, and the neck and tail are short. Adult breeding: dark brown hood, often looking black. Upperparts pale grey. Bill and legs red. Adult non-breeding: obvious dark ear-patch. Bill and legs red or red-brown, the bill with a noticeable dark tip. Juvenile: heavily marked with gingery and reddish-brown on the upperparts and wings. Black tail-band. Bill and legs pale yellowish, the bill with a dark tip. Voice: very noisy, the usual call being a harsh “kreearr”. L. 35-39 cm ; W. 86-99 cm. Similar species: Slender-billed Gull, Mediterranean Gull. The smallest of the gulls, as indicated by its name. Bill short and fine. Tail short. Wing rounded with a white tip in the adult, with the underwing distinctively blackish. Narrow white rim at the rear of the eye. Rapid wingbeats and erratic flight. Adult breeding: black hood, blackish-brown bill appearing black, pale red legs, pink tints on the underparts. Adult non-breeding: blackish ear-patch and top of head. Underparts white. Bill black. Legs dull red. Juvenile / 1st winter: crown, nape, mantle, and ear-patch blackish. Back also marked with blackish. Dark W-shaped pattern on the wings. Faint dark bar on the secondaries. Black terminal band on the tail. Underwing white. Bill black and legs flesh-coloured. 1st winter is like the adult winter with juvenile wings and tail. L. 24-28 cm ; W. 62-69 cm. A little larger than a Black-headed Gull with a more angular head, a heavier, shorter bill, broader, slightly shorter and more rounded wings, and longer legs. Adult: black hood extending down to the nape and contrasting strongly with the very pale grey upperparts. This hood changes into a dark ear-patch behind the eye in winter. Remiges very white. Bill and legs dark red. Juvenile and 1st winter: very similar to the Common Gull, but with very well-defined scaly markings above, and underparts whiter. The bill is black or dark with some red at the base. The legs are dark. In flight, 1st winter has the upperparts paler, underwing unmarked white, greater coverts pale grey, primaries black with small pale spots near the tips, and a narrow terminal band on the tail. Voice: distinctive rising and falling call, plaintive “yi-ah”. L. 37-40 cm ; W. 94-102 cm. Similar species: Common Gull, Black-headed Gull. Compared with the European Herring Gull and the Yellow-legged Gull, a little smaller and more elegant. Bill shorter and stouter. Forehead more sloping. Neck longer. Wings longer and narrower. The rear of the body is slimmer. Flight more relaxed, with more gliding. 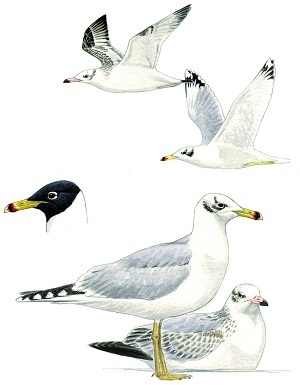 Adult: compared with the Yellow-legged Gull, distinguished by the dark red bill looking black from a distance, the very dark iris, greenish or dark grey legs, paler grey on the mantle and upperwings, with no conspicuous pale trailing edge to the wing, a very small mirror on the outermost primary, and a “string of pearls” at the tips of the outer primaries. Juvenile and 1st winter: similar to Yellow-legged Gull and Lesser Black-backed Gull, but with the underwing darker, heavily marked. The dark remiges are separated by a pale central panel. From above, the primaries are uniformly dark. There is a white U-shaped mark on the upper tail coverts, contrasting with the dark tail. At rest, the greater coverts have clear pale edges with little notching. The 1st winter has the mantle pale grey with variable dark brown centres to the feathers. Voice: contact call at colonies: nasal “gleh-i-eh”. Alarm call a low “ug-ug-uk”. L. 44-52 cm ; W. 117-128 cm. Similar to the Sooty Gull. Appears dark overall. Underwings dark. Slender shape with a long bill. 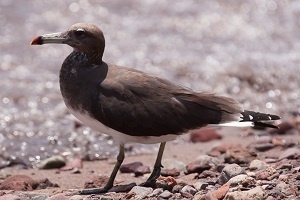 Differs from the Sooty Gull by its slightly smaller size, slimmer shape, and finer bill appearing dark from a distance. Adult: grey hood and broad white crescents below and above the eye. Bill red with a black tip. Greyer and paler on the upperparts and chest. Legs yellow. In non-breeding plumage, the hood is marked with white. Juvenile: general appearance and markings on the upperparts darker and less contrasting than in the related species. Greyish U on the rump. Broad white crescents around the eye. Bill dark. Voice: similar to Sooty Gull, but a little lower and less harsh. L. 39-43 cm ; W. 100-109 cm. Similar size to European Herring Gull, but body slimmer and wings longer. Forehead noticeably sloping, reinforcing the long, heavy appearance of the bill. 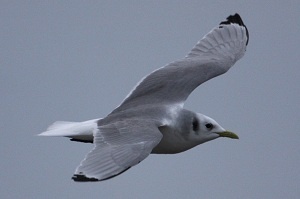 In flight, the wings are a little narrower than in the other large gulls, and the deep chest combined with the long head and big bill create a front-heavy impression. Adult: unmistakeable in breeding plumage due to its black head. Bill yellowish with a black cross-band. Legs yellowish. In non-breeding plumage, black mask behind the eye. Wing very white with only a black crescent-shaped band on the outer edge. Juvenile/ 1st winter: scaly brown markings above. Sides of the chest brown, contrasting with the white belly. Pale central area on the inner half of the wing formed by the largely pale grey greater coverts. Upperwing very white. Broad clear terminal band on the tail. Bill pale with a dark tip, and legs greyish or brownish-flesh. The 1st winter is similar, but with the back grey. 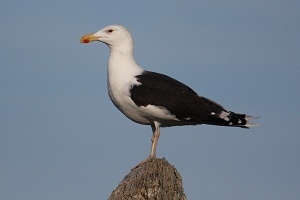 Voice: flight call a low, nasal “aah”, fairly similar to the Lesser Black-backed Gull. L. 58-67 cm ; W. 146-142 cm. Size of a Common Gull, but with long dark wings. Bill long, similar to White-eyed Gull. Distinguished from that species in all plumages by its heavier bill, which is bicoloured with a distinct black tip, and its heavier build. Adult breeding: head and foreneck dark brown. Usually a single white crescent above the eye. Chest and upperparts brownish-grey set off by a half-collar around the lower nape. Bill greenish with black subterminal band and red tip. Legs greenish-yellow. Adult non-breeding: like the breeding adult, but with the hood uniform grey-brown. Half-collar darker. Juvenile: legs grey. Bill pale at the base with a black tip. Head and neck uniformly pale grey-brown. Inconspicuous pale crescent above the eye. Broad pale fringes on the upperparts. Tail mainly white with a neat dark terminal band. Voice: display call recalls that of the Black-legged Kittiwake, “vaahhh-va-va-veh-vaaah”. Other calls are louder and harsher than those of the White-eyed Gull. L. 42-45 cm ; W. 105-113 cm. Slightly larger than the Black-headed Gull. Similar species to the European Herring Gull, but noticeably smaller. Small slim bill, and rounded head. Flight relatively buoyant, direct, with deep energetic wingbeats. Adult: bill yellow. Legs greenish yellow. Eye dark. Upperparts grey with a broad white tertial crescent. 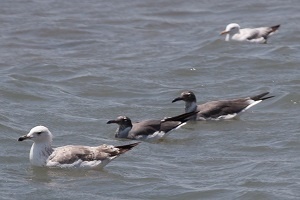 In non-breeding plumage, head streaked grey-brown, and bill greenish on the basal 2/3 with a black subterminal band and yellowish tip. Juvenile and 1st winter: head and chest brownish with scaly pattern on the upperparts. The 1st winter has the bill pink with a black tip, legs pale flesh, back dark grey, greater coverts dirty brown, underwing coarsely marked, and a broad neat terminal band on the tail. Voice: contact call a distinctive “ghia”. Voix : cri de contact caractéristique « ghia ». L. 40-46 cm ; W. 100-115 cm. Similar species: European Herring Gull, Mediterranean Gull. Similar to the Yellow-legged Gull and Caspian Gull, but a little smaller, bill proportionally shorter and thicker, legs slightly longer. Head also more rounded. Adult: has a distinctive black subterminal band on the bill in non-breeding plumage, which is often retained in summer. 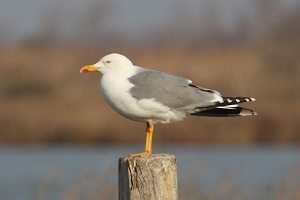 The iris is darker on average than in the Yellow-legged Gull. Compared with that species, the grey upperparts are slightly more intense, and the black on the wingtip is more extensive, usually with a single white mirror on the outermost primary. 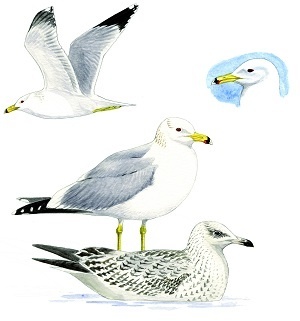 Immatures: very similar to the Yellow-legged Gull. Size and shape are essential for distinguishing them. Voice: like the Yellow-legged Gull, nasal and deep, but very slightly higher-pitched. L. 50-56 cm ; W. 115-135 cm. The largest gull. Thick neck and very heavy bill. Wings broad. Flight majestic with slow wingbeats. Legs dark pink at all ages. Adult: upperparts blackish. Bill yellow with a red spot on the lower mandible. Eye yellowish-grey with red orbital ring. Much white in the outermost primary, and broad white edge to the wing in flight. Juvenile/ 1st winter: head mottled. Bill black. Eye brown. Back dark, with fairly broad neat whitish edgings. Tertials dark with broad white tips. In flight, pale inner primaries, and narrow tail band. Voice: loud, deep, characteristically harsh and hollow-sounding “aouk”. L. 61-74 cm ; W. 144-166 cm. Similar to the European Herring Gull. Adults have the head whiter on the whole in autumn and winter, with streaking absent or insignificant, and yellow legs. Distinguished from the European Herring Gull by slightly longer wings in flight, upperparts and wings fairly dark grey, and less bluish; more black on the outer primaries with more white mirrors (which are also smaller) at the tip. The red spot on the bill is slightly larger. The orbital ring is red or orange. Juvenile/ 1st winter: compared with European Herring Gull, at rest, the wings are very long. The shafts of the tertials are completely black. The head and underparts are usually paler, and the bill is black. The iris is dark. In flight, the inner primaries are quite dark, and the bases of the feathers are paler. In the 1st winter, grey feather on the mantle from October onwards. Voice: deeper and more nasal than European Herring Gull. L. 52-58 cm ; W. 120-140 cm. Larger than the Common Gull. The legs are flesh-coloured at all ages. Adult: head, neck, chest, belly, and tail white in summer. The head and the neck are heavily streaked with grey-brown in winter. The upperparts and wings are pale grey. The black wingtip is marked with several white spots. The bill is yellow with an orange-red spot on the lower mandible. Eye yellow with yellow or orange orbital ring. Juvenile/ 1st winter: marked with brown all over, with the head dirty brown, the ends of the wings looking fairly compact at rest, tertials with pale notching. The bill is dark, with a paler base of variable extent. In flight the inner primaries are paler than the outers, the upper tail coverts and tail base are spotted with grey, and do not contrast strongly with the terminal band. The 1st winter is similar to the juvenile, but paler and with barred scapulars. Voice: well-known display call a loud, piercing “ow-kailli-kow-kow-kow-kow-kow-kow-ow-ow”. Contact call, harsh “gyow”. Anxiety call, characteristic “gag-ag-ag”. L. 54-60 cm ; W. 123-148 cm. 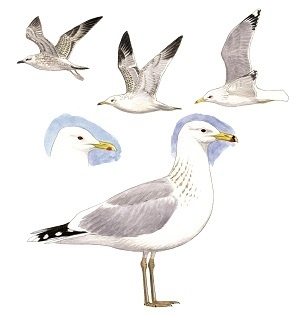 Similar to the Yellow-legged Gull. It is nearly as large. 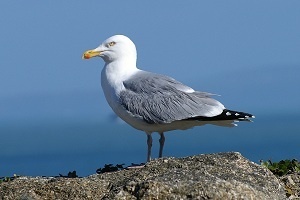 Compared with the European Herring Gull, a little slimmer, head slightly smaller, with a flat forehead and more angular rear crown, long bill and neck giving it a characteristic silhouette, legs and wings longer. The bill usually has no obvious gonydial angle. The upright posture, with the rounded chest, long legs, wings held low, and tail raised give it a distinctive shape. Adult: bill yellow with a small red spot on the lower mandible. It becomes pale green-yellow in winter. The legs are yellow becoming pale buff-pink in winter (paler than in the European Herring Gull). The eye is usually dark in 75% of individuals. Compared with the Yellow-legged Gull and Armenian Gull, the upperparts are paler grey, the wingtip has less black, with more white mirrors and tongues extending further into the black. Head appears white, but with very indistinct streaks around the eye and on the crown visible at close range. Juvenile/ 1st winter: head whitish with a darker band on the lower hind neck. Bill completely black. In flight, pale underwing, diffuse wingbar, whitish rump, and distinct black tail band. Upperparts pale grey-brown. The greater coverts show fine patterning at rest. The tertials are variable, from fairly uniform dark with a broad white tip, to dark with a narrower white tip. The 1st winter acquires grey feathers on the mantle from October onwards. Voice: higher pitched than in Yellow-legged Gull. Slightly smaller or the same size compared with the European Herring Gull. Body slender, wings long and pointed compared with the Great Black-backed Gull, with a finer bill. Adult: legs yellow. Upperparts slate-grey to black. Eye yellow and orbital ring red. The white trailing edge to the wing is incomplete. Juvenile / 1st winter: difficult to distinguish from the Great Black-backed Gull, and especially from the Yellow-legged Gull, Caspian Gull, and European Herring Gull. Bill and eye dark. Legs flesh-coloured. At rest, quite dark overall. Outer greater coverts dark and uniform. No broad notches on the tertials. 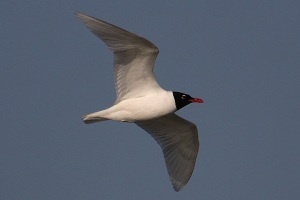 In flight, primaries uniformly dark, conspicuous white rump contrasting with the dark tail to form a well-defined band. Voice: like the European Herring Gull, but noticeably higher pitched and more nasal. L. 48-56 cm ; W. 117-134 cm.